Ascot Vale railway station is located off Station Avenue on its east side and on The Crescent on its west side. 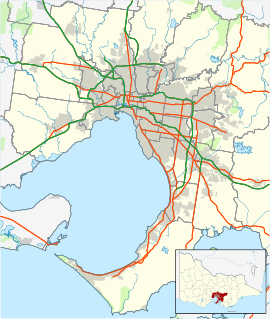 It is on the Craigieburn railway line, part of the Melbourne suburban rail system. Trains take 10 minutes to get to the City Loop from Ascot Vale. Tram route 57 runs along Epsom Road, Union Road and Maribyrnong Road, tram route 59 runs along Mount Alexander Road, and tram route 82 runs along Maribyrnong Road. Ascot Vale West Post Office opened on 1 January 1888 and was renamed Ascot Vale around 1893. An Ascot Vale East office was open from 1914 until 1979. The Temperance Township Estate in Ascot Vale, bounded by Union, Maribyrnong and Epsom Roads, was established with a caveat on each title preventing the distilling, brewing, or the serving of alcoholic beverages, but hotels were soon built at the outside corners of the settlement. In the 2016 Census, there were 14,750 people in Ascot Vale. 64.5% of people were born in Australia. The next most common countries of birth were Vietnam 2.8%, England 2.3%, Italy 2.2%, China 1.7% and New Zealand 1.6%. 66.2% of people only spoke English at home. Other languages spoken at home included Italian 3.7%, Vietnamese 3.3%, Greek 2.4%, Cantonese 1.8% and Arabic 1.8%. The most common responses for religion were No Religion 34.5% and Catholic 29.1%. A major landmark in the suburb is the Royal Melbourne Showgrounds, which has special events such as the annual Royal Melbourne Show. The Showgrounds are adjacent to the Flemington Racecourse which is in neighbouring Flemington. Ascot Vale has the Ascot Vale Special School, Ascot Vale Primary School, Ascot Vale West Primary School, St Mary's Catholic Primary School and the arts program of Western Autistic School. Golfers play at the course of the Riverside Golf Club on Newsom Street. Ascot Vale is the home of the Melbourne Aces, of the Australian Baseball League, who play home games at the Melbourne Showgrounds. Wikivoyage has a travel guide for Ascot Vale. ^ a b Australian Bureau of Statistics (27 June 2017). "Ascot Vale (State Suburb)". 2016 Census QuickStats. Retrieved 11 February 2018.